Home Blog News From the Field What To Do With All That Ghost Gear? What To Do With All That Ghost Gear? One of the greatest obstacles the Olive Ridley Project faces is knowing just what to do with the vast quantity of ghost gear collected. We have recently embarked on an exciting partnership with Seher Mirza, a textile researcher at the Royal College of Arts. 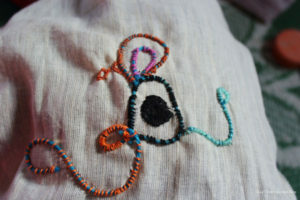 Our partnership with her will enable us to reuse ghost gear in creative community projects in Pakistan. Seher Mirza explaining how ghost nets can be reused to provide an alternative income for the fishers of Rehmangoth. S jo accessories is the creative outlet of design-led research and development project ‘Threads of the Indus’, committed to empowering village-based marginalised craft communities towards creating social change through their own agency. 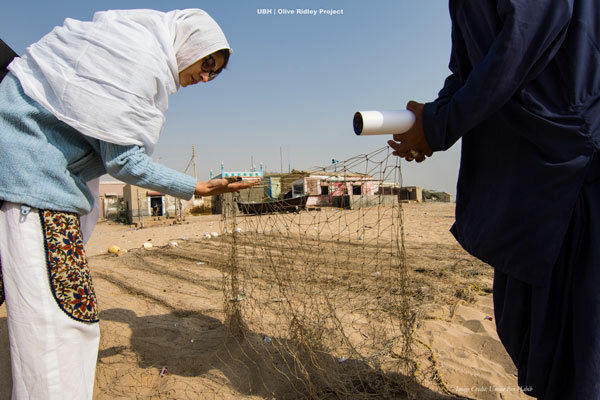 Central Saint Martins (UAL) textile design graduate, Seher Mirza, initiated the project in 2009/10, as part of her PhD design research at the Royal College of Art, London. The products created in rigorous design workshops are a combined effort between Seher and the traditional craftswomen, a testament to their design journey together. 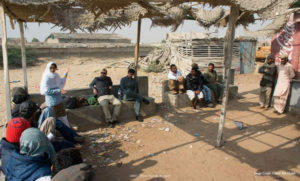 The project is now self-funded, having worked with Sindh Rural Support Organisation in the past. 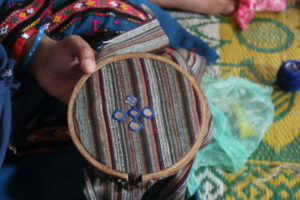 Concerned about the deteriorating quality of craftsmanship in traditional textile crafts in her native country, and the lack of emotional connection between maker and craft, Seher decided to address this through her own design and craft practice and started the project. S jo’s unique pieces reignite passion, excitement, and inspiration between craftswoman and her traditional craft. By encouraging creativity, design thinking, and design decision-making, it enables personal development of the women while creating a sustainable fair wage income. The work has been sold at the Victoria and Albert Museum in London among other venues. It was featured in the World of Interiors magazine and listed as an ethical brand in the Ethical Fashion Forum directory of 2016. Nazatun keen to help Seher clean ghost nets before being used by the women of Rehmangoth. Artisan showing an example of what can be made from ghost nets. 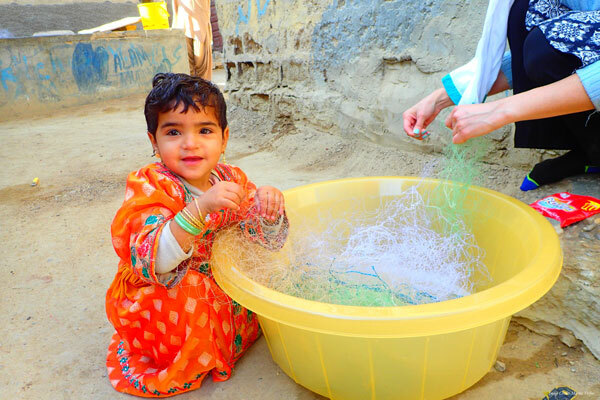 It is our hope that Seher will be able to use her textile expertise to transform the large amounts of ghost gear collected by our team in Pakistan. Our collaboration will result in the production of a range of handcrafted products that build on local artisans’ existing unique skills. The women of Rehmangoth are busy testing the ghost nets and have produced incredible samples, showcasing the possibilities of this unusual material. We are excited to see this project develop over the next few months and are extremely hopeful that it will eventually provide an alternative income for the women and the community. If this pilot project is successful, we will replicate it in other costal villages. Furthermore, if the results of the project are positive, we hope that in time it will become a self-sustaining initiative. Stay tuned for updates and to find out how you can give a new life to recycled fishing nets by purchasing ghost gear products made by traditional artisans in Pakistan. Made with ghost nets by the women of Rehmangoth fishing community. We would like to extend a huge thank you to World Animal Protection and Ocean Conservancy through the platform of the Global Ghost Gear Initiative (GGGI) and WWF-Pakistan. We would also like to thank volunteers Sharmeen Khan, Umair Bin Habib, Syed Khurram Jamal, Hasan Lanewala, Abdul Aleem Shekhani. Without the help of these organizations and individuals this project would not have been possible.